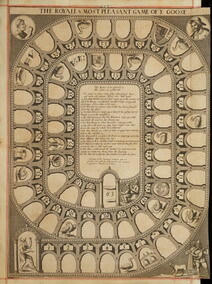 stampatore: Printed and sould by John Overton over at St. Sepulchre’s Church, in London. descrizione: Gioco di 63 caselle numerate, spirale, antiorario, centripeto. 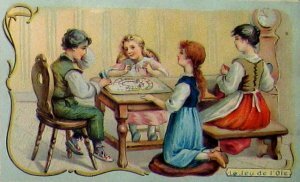 E' considerato il più antico gioco inglese conosciuto. NOTA: Vedi esemplare Arch. n°926 e Arch. n°2366. 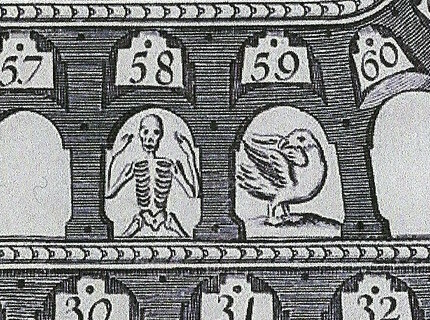 The Twelve good rules, the Royal Game of Goose." 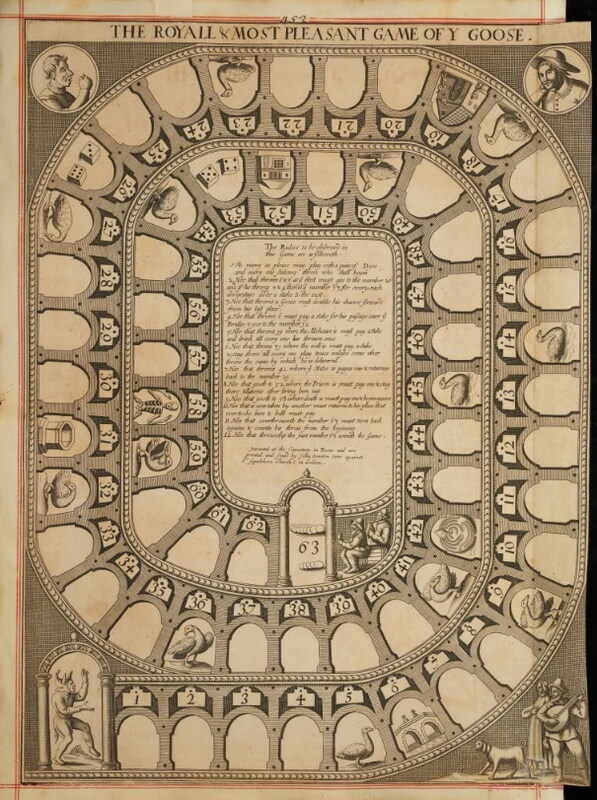 This also is that game of Goose to which both John Jefferys in his Play of Geography, 1759, and Mrs. Newbery’s Game of Human Life, 1780, refer. Another game exactly similar in design was published by Robt. Sayer at The Golden Buck, Nr. Serjeant’s Inn, Fleet Street: like Overton's, it too is not dated. 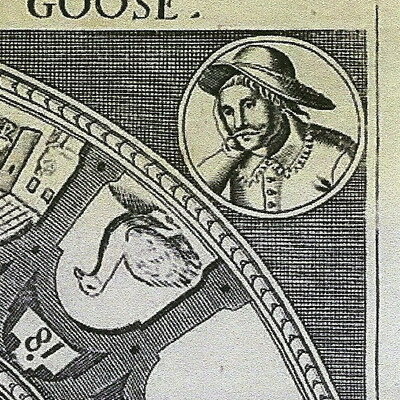 The fact that Jefferys instructed the players of his game in 1759 to “proceed as in the game of Goose" suggests the latter being widely known and without any definite evidence, 1750 may be accepted as a probable publishing date. 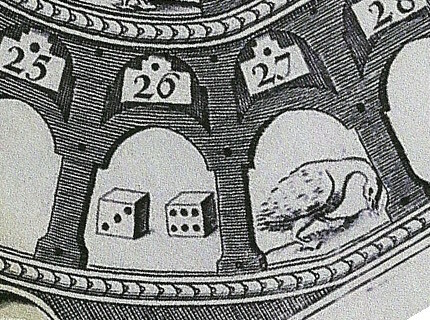 This is the earliest of all table games of this character. Author's copy is uncut and even unfolded-where has it lain all the 200 years since it was sold at “Ye White Horse without Newgate”? Forty years were then still to pass until, with the fall of the Bastille in 1789, the Kingdom of France ended with the execution of Louis XVI in 1793. THE ROYALL & MOST PLEASANT GAME OF Y GOOSE. 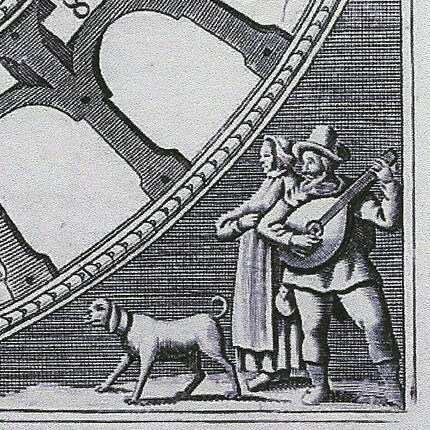 London: Invented at the Consistory in Rome and printed and sould by John Overton over at St. Sepulchre’s Church, in London. . Copper engraving, 51 × 36.5 cm. (Lender: The Pierpont Morgan Library, New York; gift of Mrs. Joy Macdonald in memory of her husband, David R. Macdonald, 2009.). Ref. : Whitehouse, pp. 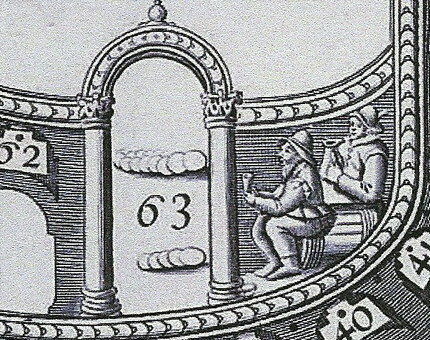 55–56. 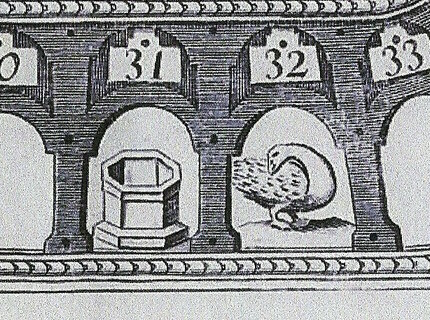 The imprint is that of John Overton (1) but is concealed by a later label: “Sold at the Black Lyon in Exeter Exchange in the Strand London. 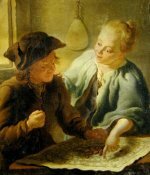 Where you may have Musick prick’d.” Laurence Worms notes that the musical instrument-maker, printer and publisher, Henry Waylett (fl. 1743-72) was certainly “At the Black Lyon in Exeter Change” in 1744. Given the reference to music, it appears likely that the later label isindeed that of Waylett. It is not known whether this Morgan copy is an original print by John Overton or, less likely, a re-strike. 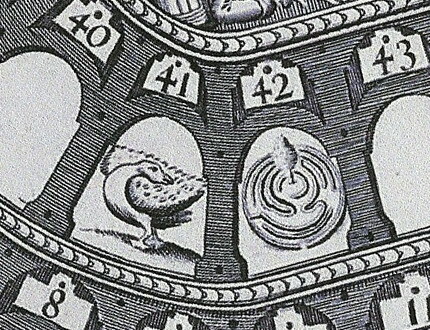 The reference in Overton’s imprint to the game’s being “invented at the Consistory in Rome” is considered further in the “Early History” essay in this catalogue (2). 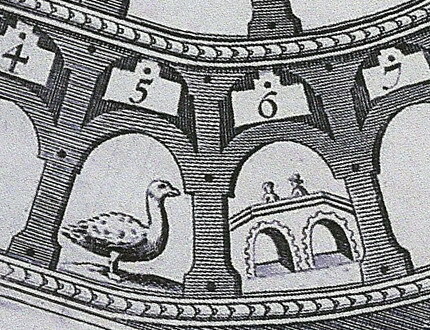 The game itself is a classic Goose game, having all the features and rules possessed by the Lucchino Gargano game of 1598. Comparing these two games shows the obvious similarities of the representations of the geese and of the symbols on the hazard spaces. 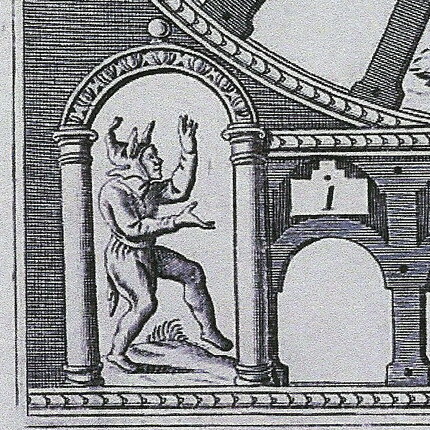 The decorative iconography also has common elements, notably the jester figure at the start and the drinking scene at the end of the spiral. 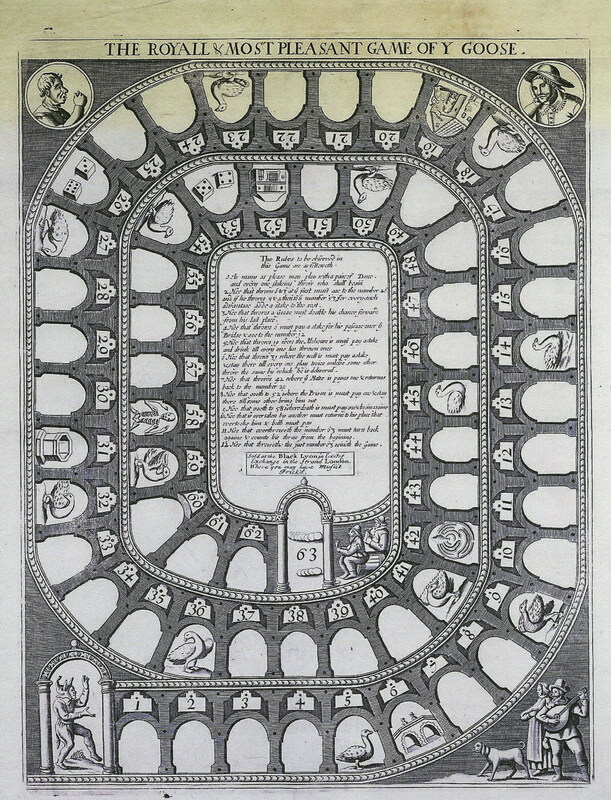 It is tempting to associate this Italianate iconography with the game registered by John Wolfe in 1597 (no known copy), since he had trained as a journeyman printer in Florence before becoming Printer to the City of London. The portrait medallions, not found in Italian games, are a mystery. They surely represent types of personages rather than individuals: parliamentarian versus royalist? 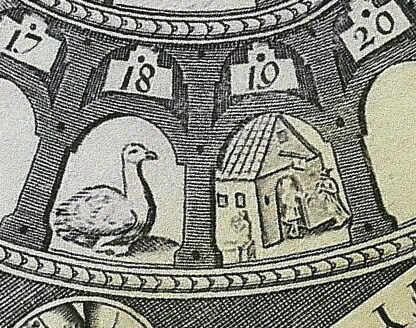 Curiously, medallions with images of this exact kind routinely appeared on Dutch Goose games of this type well into the nineteenth century, whereas the English printers, while likewise continuing with medallions as decoration, did update their pictorial content. etc. no. 3 (also known as the Term Catalogues). (2) The argument for Christian symbolism in the game receives a boost from the phrase found in the earliest surviving English versions: “Invented at the Consistory in Rome,” the Consistory being the administrative arm of the Roman Catholic Church. There is no independent evidence for this assertion, no doubt copied unthinkingly from printer to printer. 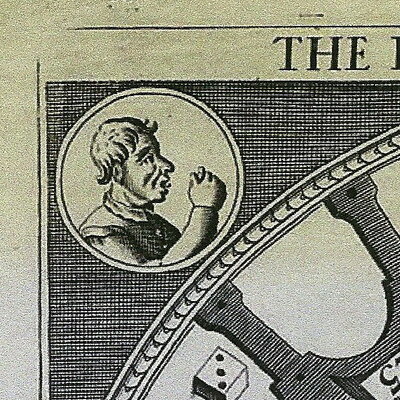 John Wolfe, the introducer of the game to England, had trained in Italy, and it may be that his game included the assertion. 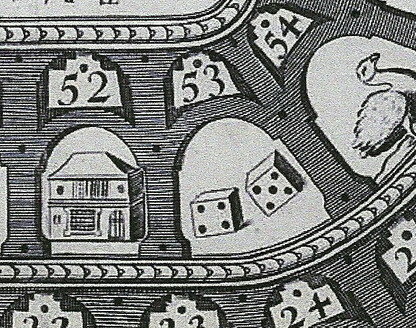 It does in any case conflict with the claim by Carrera, that the game was invented in Florence. 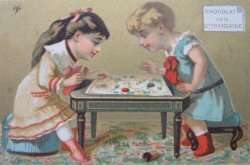 25) LIMAN, Ellen: "Georgian and Victorian Board Games: The Liman Collection", Pointed Leaf Press, 2017.